The Kramer VP-440 is a high performance presentation scaler/switcher with four HDMI and two computer graphics (VGA) inputs. 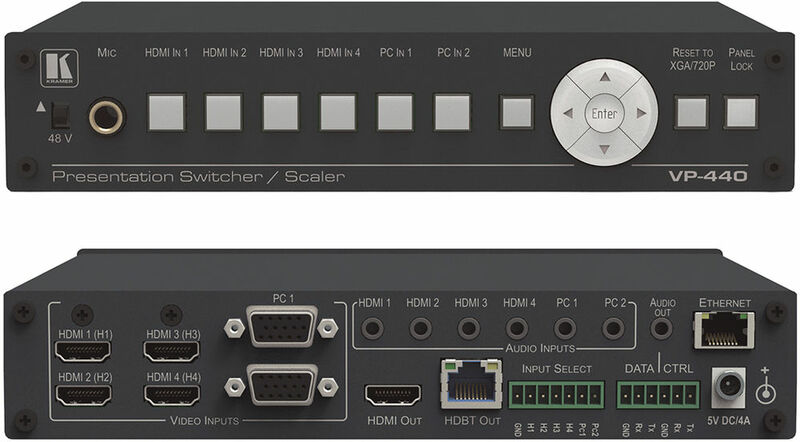 The unit scales the video, embeds the audio and outputs the signal to an HDMI output and an HDBaseT output simultaneously. The unit includes analogue and embedded audio inputs and outputs. PixPerfect™ Scaling Technology - Kramer's precision pixel mapping and high-quality scaling technology. High-quality 3:2 and 2:2 pull down de-interlacing and full up- and down-scaling of all video input signals. System Range - For the HDBaseT inputs and outputs, up to 70m (230ft). Cables - For optimum range and performance using HDBaseT™, use Kramer's BC-UNIKat cable. Note that the transmission range depends on the signal resolution, source and display used. The distance using non-Kramer CAT 6 cable may not reach these ranges. Max VGA Resolution - 1920 x 1200 @60Hz. Output Resolutions - Up to UXGA/1080p output resolutions. Built-in ProcAmp - Colour, hue, sharpness, noise, contrast and brightness. Colour Sampling - Supports 4:4:4 (RGB and YUV) as well as 4:2:2 (YUV) colour sampling in native mode. Audio - Unbalanced stereo and embedded audio for HDMI/HDBaseT with individual input level controls. Companion AFV (Audio-Follow-Video) - Stereo audio for every input, on terminal blocks. Dedicated RS-232 Port - For bidirectional data tunneling via HDBaseT. Multiple Control Options - Front panel buttons, Ethernet with built-in Web pages, OSD (on-screen display), RS-232, remote contact closure switches. Product Weight 1.1kg (2.4lbs) approx. Shipping Weight 1.5kg (3.4lbs) approx.